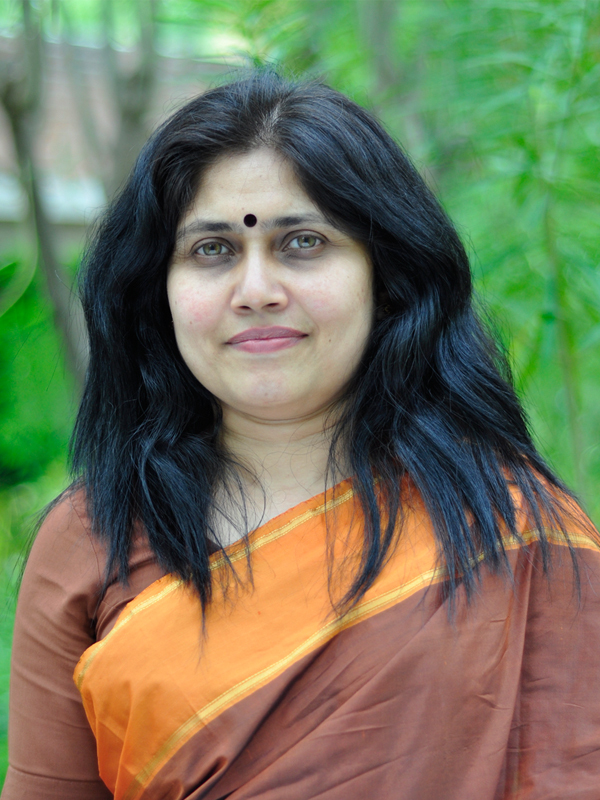 Dr. Anita Basalingappa is Professor in Marketing and Chairperson – Online Programs. Prior to joining MICA, she was associated with Vishesh Advertising Pvt. Ltd., Bangalore, Indian Institute of Management, Ahmedabad and Karnatak University, Dharwad. Her current areas of interest also include marketing and competition, understanding social media as brands and social media behaviour, marketing decision-making, clothing as communication and CSR. In the past, in 2008, she has also worked on ‘Introducing Common Market Identity’ during her fellowship at Judge Business School and Sidney Sussex College, University of Cambridge, Cambridge, UK. She has been teaching MARKSTRAT, Return on Marketing Investment/ Metrics and Measurement in Marketing, Marketing Theory, Customer Relationship Marketing, Services Marketing, Brand Theory and Research and Blue Ocean Strategy Simulation across programmes at MICA since 2004. She has presented and published papers across conferences of repute, serves as a reviewer for various journals and is on the advisory board for a couple of organizations. She has also been guiding doctoral level dissertations since 2010. In addition, she has served as Chairperson of the marketing department for 4 years, Admissions committee for 3 years, FPM Program for 3 years and Research Committee for a year at MICA, apart from being a member on various other committees. She holds a Bachelor of Science (Honours) degree in Mathematics, an MBA in Marketing and a Ph.D. in Customer Relationship Marketing from Karnatak University, Dharwad, India. Basalingappa, A. (2014). For God’s Sake: An Adman on the Business of Religion [Review of the book For God’s Sake: An Adman on the Business of Religion by Ambi Parmeswaran]. Vikalpa, 34(4) 121-123. Basalingappa, A. (2012). MOVE and the issue of Sustainability in Marketing at the Bottom of Pyramid. In Subhas M. S. (Eds. ), Entrepreneurship and Business Development in India. Vol. 2, Excel India Publishers, New Delhi. Subhas, M, S. and Basalingappa, A. (2011). Reincarnation of microfinance for development of micro enterprises at the Bottom of Pyramid (BOP). In Subhas M. S. (Eds. ), Entrepreneurship and Business Development in India. Vol. 1, Excel India Publishers, New Delhi, pp 209-223. Purushottaman, S., Subhas, M, S., Brockington, J., Basalingappa, A., Basu, S. (2011). Market oriented value enhancement: For commodities and services. Books for Change. Second Edition. ISBN: 978-81-8291-078-2. Ranchhod, A., Basalingappa, A., (2010). Report on Sports Marketing in India. MICA. Basalingappa, A., (2008). A Report on Introducing Common Market Identity for customers. D C Pavate Foundation, Karnatak University Dharwad. Basalingappa, A. (2005). Conceptual Note on Measuring Return on Advertising Expenses. Chanakya, Kirloskar Institute of Advanced Management Studies, Harihar. Basalingappa, A. (2004). Impact of Critical Performance Attributes on Satisfaction & Loyalty: The Case of Internet Service Providers. Chrysalis, 1(1) 10-12. Basalingappa, A. (2012). Tata Nano: A case study in marketing a good product badly. WARC Exclusive, MICA. Basalingappa, A. (2011). Case Analysis II [Sugar Free: Management Case by Preeta H. Vyas]. Vikalpa, 36(1), 106-109. Pant, S., Basalingappa, A. (2016). Understanding smartphone app usage among young adults in India. in the proceedings of 5th International Conference on Communication, Media, Technology and Design, May 27-29, 2016, Zagreb, Croatia. Basalingappa, A., Kumar J. K. (2016). Communication, Marketing and Democracy: Towards A Dialogue Between Communication Theory and Marketing Theory. in the proceedings of 3rd International Communication Management Conference, February 2016, MICA, Ahmedabad, India. Basalingappa, A., Subhas M. S. and Tapariya, R. (2016). Understanding Likes on Twitter. in the proceedings of 3rd International Communication Management Conference, February 2016, MICA, Ahmedabad, India. Basalingappa, A., Subhas M. S. and Tapariya, R. (2015). Understanding Likes on facebook. in the proceedings of 4th International Conference on Communication, Media, Technology and Design, May 2015, Sharjah, UAE. Basalingappa, A. (2014). Role of Factual Evidence and Experience on Intuition and Strategic Marketing Decision Making. in the proceedings of International Conference of Contemporary Management, University of Jaffna, March 2014, Jaffna, Sri Lanka. Basalingappa, A. (2013). Dupatta: Muslim and Non Muslim Women in India. in the proceedings of 4th Global Islamic Marketing Conference, May 2013, Istanbul, Turkey. Basalingappa, A. and Subhas M. S. (2013). Customer Relationships in Rural Retail. in the proceedings of 5th IIMA Conference on Marketing in Emerging Economies, January 2013, IIM Ahmedabad, India. Basalingappa, A. (2012). Zero base review of Customer Behavior. in the proceedings of 3rd Global Islamic Marketing Conference, December 2012, Cairo, Egypt. Subhas M. S. and Basalingappa, A. (2011). Reincarnation of microfinance for development of micro enterprises at the Bottom of Pyramid (BOP). in the proceedings of National Conference on Entrepreneurship and Business Development in India: Issues and Cases, November 2011, Kousali Institute of Management Studies, Karnatak University Dharwad, India. Basalingappa, A. and Subhas M. S. (2011). Differential Influences of Market Structure on Cognition and Affect. in the proceedings of INFORMS Marketing Science Conference, June 2011, Rice University, Houston, Texas, USA. Basalingappa, A. and Subhas M. S. (2011). Common Market Identity vis-à-vis Loyalty Card: A retailers’ perspective. in the proceedings of 4th IIMA Conference on Marketing in Emerging Economies, January 2011, IIM Ahmedabad, India. Basalingappa, A. and Subhas M. S. (2009). Attitude of Shoppers and Retailers towards introducing a Common Market Identity. in the proceedings of INFORMS Marketing Science Conference, June 2009, Ann Arbor, Michigan, USA. Basalingappa, A. and Subhas M. S. (2009). Impact of Traditional Marketing Practices and Relationship Marketing Practices on manifestation of Customer Loyalty. in the proceedings of 8th International Conference Marketing Trends, January 2009, Paris-Venice, ed. Jean-Claude Andreani and Umberto Collesei, Paris-Venice: Marketing Trends Association, http://www.marketing-trends-congress.com/taxonomy/term/5239 Retrieved 2012-05-20. ISBN 978-2-9532811-2-5. Oburai, P., Constantine, A., Gotsi, M., Basalingappa, A. and Baker, M. (2008). Multiple Stakeholders Views of Corporate Brand Image: Antecedents, Mediators and Role of Stakeholders Expectations. in the proceedings of Academy of Marketing Annual Conference, July 2008, Aberdeen Business School, Aberdeen, UK. Oburai, P., Moorthy, Y. L. R., Basalingappa, A., Baker, M. and Kok, W. C. (2006). An Empirical Investigation of Corporate Brand Image: Antecedents, Mediating Role and Impact on Stakeholder Expectations. in the proceedings of 35th Annual Conference of European Marketing Academy, May 2006, Athens, Greece. Oburai, P., Moorthy, Y. L. R., Basalingappa, A., Baker, M. and Krishnan, S. (2006). Corporate Brand Image: Antecedents, Mediating Role and Impact of Stakeholder Expectations. in the proceedings of International Conference on Return on Marketing Investment, January 2006, Indian Institute of management Ahmedabad and Goizueta Business School, Emory University, Atlanta. Basalingappa, A. and Subhas M. S. (2005). Factors affecting Relationship Performance in B to C Markets. in the proceedings of International Conference on Marketing Paradigms in Emerging Economies, January 2005, IIM Ahmedabad, India. Basalingappa, A., Subhas M. S. and Pawate, M. (2004). Impact of RFM on Trust, Commitment & Satisfaction. in the proceedings of International Conference on Management, December 2004, Association of Indian Management Scholars- International, Prairie View A&M University and IIM Kolkata, India. Basalingappa, A. and Subhas M. S. (2003). Role of CRM in Brand Attitude Formation and its Impact on Brand Loyalty. in the proceedings of National Seminar on Branding in Indian Markets, December 2003, IIM Kozhikode (Calicut), India. Basalingappa, A. and Subhas M. S. (2003). Differential Influences of Market Structures on Conation, Customer Satisfaction and Customer Loyalty in the proceedings of International Conference on Management, December 2003, Association of Indian Management Scholars- International, Prairie View A&M University and IIM Bangalore, India. Basalingappa, A. and Subhas M. S. (2003). Manifestation of Customer Uncertainty & Its Impact on Customer Satisfaction and Customer Loyalty. in the proceedings of National Conference on Emerging trends in Service Sector, Issues, Challenges & Dimensions, March 2003, KLS Institute of Management Education and Research, Belgaum, India. Basalingappa, A. and Subhas M. S. (2002). Impact of Value Added Services on New and Existing Customers for Cellular Service Providers. in the proceedings of International Conference on Marketing of Technology Oriented Products and Services, December 2002, IIM Bangalore and Georgia Tech University, Atlanta. Basalingappa, A. (2000). Impact of Critical Performance Attributes on Satisfaction & Loyalty: The Case of Internet Service Providers. in the proceedings of International Conference on Customer Relationship Management – Emerging Concepts, Tools and Applications, November 2000, MDI, Gurgaon, India and iCRM, Atlanta. Basalingappa, A. and Subhas M. S. (2000). Impact of Exaggerations on Web users in Online Advertisements. in the proceedings of International Seminar on Marketing on Internet, February 2000, Invertis Institute of Management Studies, Bareilly, UP, India. Basalingappa, A. and Subhas M. S. (2000). Web users Assessment of Online Advertising. in the proceedings of International Seminar on Marketing on Internet, February 2000, Invertis Institute of Management Studies, Bareilly, UP, India. Basalingappa, A. (2006). More than 1000 words. Financial Express Insight, August 2006. Basalingappa, A. (2006). Best of both worlds. Financial Express Insight, May, 2006. Basalingappa, A. (2006). How to valuate a brand. Financial Express Insight, April 6th, 2006. Basalingappa, A. (2006). ROME is the new mantra. Financial Express Insight, February 23rd, 2006.